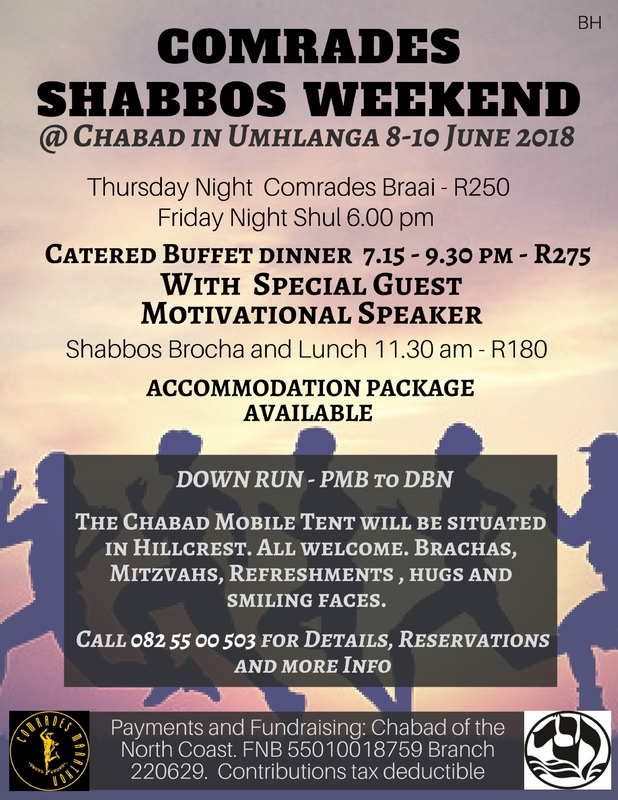 Over the past years, the Shabbos Comrades Dinner and lunch has grown and become so much part of the Comrades weekend experience. In 2011 more than 100 runners, families, supporters and guests attended the Friday night Dinner which was a great success. In 2013 there were close to 170!! In 2015 we had Tilda Tearle adress the Comrades at the Shabbos dinner. She was fantastic. The novices were in awe. Shul at approximately 7:15pm and end by 9:30pm. The Shabbos day lunch will follow a Comrades Kiddish after Shul which is great fun. Lunch cost R190 Adults and children less than 12 years R95. This year’s guest speaker is still to be announced. for 0 1 2 3 4 5 6 7 8 9 10 adults @ R275 and 0 1 2 3 4 5 6 7 8 9 10 children under 12 years @ R140. for 0 1 2 3 4 5 6 7 8 9 10 adults @ R180 and 0 1 2 3 4 5 6 7 8 9 10 children under 12 years @ R90. EFT payment details and Credit Card facilities available. Use your Surname and Comrades dinner as your referemce. Looking forward to making this years Comrades Experience better than ever! !